A Concordance to the Writings of William Blake, ed. David V. Erdman et al. Are there fairies still in London? Many subscriptions expired with Newsletter 4, and we have had to bill quite a few readers who, as contributors of material or colleagues to whom we owe scholarly favors, we’d much rather send complimentary copies. The response to our dunning notice has been gratifying, indicating that our readers understand the need for their support. It was not necessary to raise the price of subscriptions, except for overseas subscribers who wish air delivery. The supply of back copies is just about exhausted. We are now investigating the possibility of producing an offset edition of volume I for those newer subscribers who did not receive it. There is also a chance that increasing demand for the Newsletter will mean going offset in the future. For volume II, we have received some support from the University of California, providing editorial assistance; and the English Department office staff has taken over the task of production. Our existence for the present academic year is therefore assured, but after the University grant expires in June we will probably have to find some other source of aid. This will almost certainly be true if we begin offset production. Suggestions from readers are welcome. With this issue, you will receive an index to volume I, which Mr. Ruthven Todd has kindly prepared. Volume II, in response to requests from readers, is being paginated continuously rather than by separate numbers. For the information of those who want to keep their BNL’s in binders, we have found the kind called “Accogrip” useful. 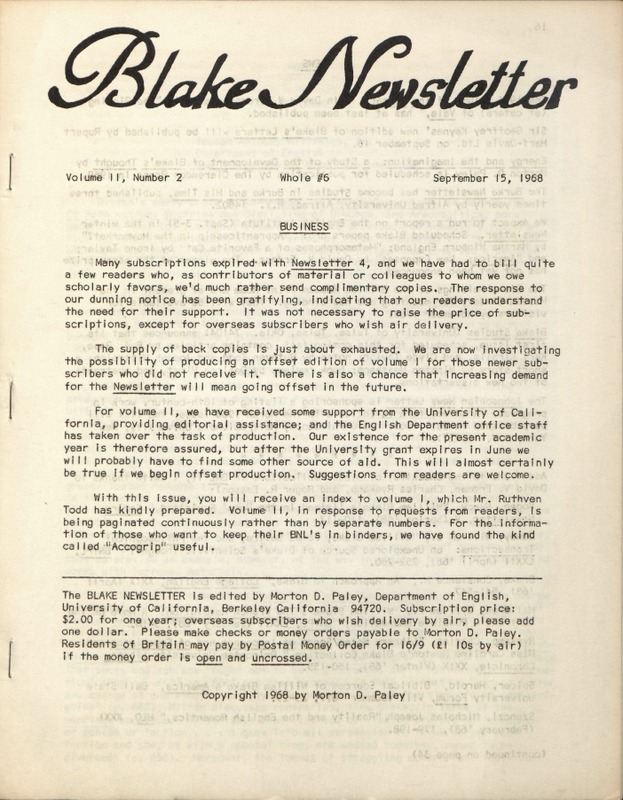 The BLAKE NEWSLETTER is edited by Morton D. Paley, Department of English, University of California, Berkeley California 94720. Subscription price: $2.00 for one year; overseas subscribers who wish delivery by air, please add one dollar. Please make checks or money orders payable to Morton D. Paley. Residents of Britain may pay by Postal Money Order for 16/9 (£1 10s by air) if the money order is open and uncrossed. The winter Newsletter will be published on December 15, 1968. Deadline for news copy is December 1.